World War I started in 1914, a century ago. Last Autumn showed the first commemorations and we will see those ad nauseum. Dignitaries will point to the progress made over that century. Yes, we have a European Union with the explicit objective to prevent war in the European theatre. Yet, it is political spin to present war as the point of reference. It is peace that is the yardstick for normality. Importantly, war is not the only way to destroy people’s lives. It can also be done by unemployment, debt, bankruptcy, home evictions, lack of medical care, reduced pensions. Last November about 26 million workers in the EU were unemployed, almost 11% of the workforce. Technology advances and current investments are mainly directed at the reduction of labour and other costs. Imagine to be unemployed for some years and having bleak prospects to find a job. A major factor in the economic crisis is the Monetary Union, with Eurozone and Euro, that was imposed by the European elite against good economic advice, see Bernard Connolly in the Wall Street Journal Feb 22 2013. The elite remains undaunted and EU president Herman van Rompuy presents a “roadmap” for “more Europe”. The elite in 2014 is as blind as in 1914. In May 2014 there are elections for the European Parliament and they come with a wry taste. We have learned a lot in the century since 1914, of course, and our democracies and technologies are advanced indeed. But WW I was caused by power elites that were far removed from the suffering of the commoners, and we still have such elites, witness the suffering of the commoners. Unemployment is first of all a sign of bad government. The European mentalities of North vs South and East vs West still clash. The division between the Eastern and Western Roman Empire still shows, as does the division between the protestants above the Rhine and the latinized roman-catholics below the Rhine. European politics focusses on smoothing those differences and describes success in those terms, e.g. in the Franco-German axis. The real focus should rather be the welfare of Europe. One might discuss why the eurosceptics remain a fringe and why they don’t manage to prioritize European welfare and make a dent. The fringe seems a lost cause however. The relevant discussion is about the center parties and their failure to prioritize European welfare. Those parties can utter anti-establishment rhetoric too but they still remain in the core, like the UK Conservatives and Forza Italia. The center parties have had their own emancipatory moments in their past. The wonder is how emancipation gets dulled, how internationally minded politicians return to nationalism, how the idea of European welfare gets lost. Surprisingly, the origin of World War I pops up as a relevant issue for a different reason. First consider the history. Nowadays we tend to think of prosperity in terms of education, technology and trade, but around 1900 the possession of fertile land and other natural resources had been the prime consideration since antiquity, and war belonged to that frame of mind. In May 1914 the capitals of Europe were already discussing war indeed. On June 28 1914, the Austro-Hungarian crown-prince Franz Ferdinand was assassinated in Sarajevo. It was an excuse as any for the power elites to start that war. The Prussian aspiration for world power has been described in admirable fashion by Sebastian Haffner (1907-1999). The main theme is that Bismarck upset the balance of power in Europe by creating a unified Germany that had not existed before. Bismarck himself managed to appease the existing powers of France, Austria, Russia and Britain but Kaiser Wilhem II removed Bismarck in 1890 and set out a path towards war. A possible influence may have been that Prussian Wilhelm had a handicapped left arm since birth and hated his English mother, a daughter of Queen Victoria of Hanoverian descent. Haffner’s book “Die sieben Todsünden des Deutschen Reiches im Ersten Weltkrieg” (1964) – The seven deadly sins of the German Reich in the First World War – apparently never got an English print, and should get one. Haffner’s original name incidently was Raimund Pretzel, see this obituary. Next to the observation that power elites can follow their own objectives thus a second point becomes relevant: the roles of Germany and Russia in the European theatre. The name “European Union” without the involvement of Russia is a misnomer, with the perverse suggestion that Russia would not be in Europe while historically it is deeply involved. The ties became complex by WW I, the Bolshevik revolution financed by Germany, and the Cold War. In perspective this complexity is just another piece of evidence for the close involvement. 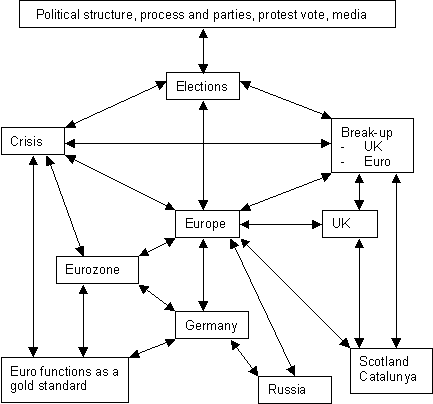 Instead of Van Rompuy’s “roadmap” let us consider the following “mindmap” for the European theatre. A mindmap consists of labels and connecting lines. (1) The “European Union” is not completely Europe and is not a Union. It is a hybrid between a free trade area and a federation. It is not only a mutant but also constantly changing, and each change causes a discussion about national sovereignty that erodes popular support. The EU is a teenager, wanting to be proud but in deep economic and political crisis. From Edinburgh to Moscow those with some education stand by and look in horror but also disarray at the political and bureaucratic incompetence. The EU better matures or ceases to exist. It seems optimal that the EU (508 million people) devolves into a free trade zone and extends with Russia (144), Belarus (9), Ukraine (45) and Turkey (76), and starts anew from there. Alternatively put, there already is the Council of Europe, and the policy focus could be to devolve the EU and to upgrade the CoE to some point of convergence. (2) Money is a disaster. The German trauma of the Great Depression of the 1930s is hyperinflation, with rising prices and falling real wages, because the Germans printed money without bound. The UK and USA remained closer to the gold standard and their trauma is deflation, with falling prices and rising real debt. The economic lesson learned in the UK and USA is more balanced. The national debt of the UK is denominated in Pounds and the UK government has some control over the Pound, and hence the crisis in the UK is less severe than in the Eurozone. Similarly for the USA and the Dollar. When the Euro was created, Germany insisted on no-bailout conditions and other rules to prevent hyperinflation. The Euro isn’t linked to gold, but its architecture implies that governments have no control over the monetary denomination of their debt. Consequently the crisis in the Eurozone is much more severe than in the UK or USA. It is possible to give the Euro another architecture and remove this element in the cause for the crisis. For a new approach to the economic theory of the optimal currency area and the banking union, see this paper. (3) The EU is already split between the Eurozone and the others. The UK is the largest non-euro country and tends to be in favour of a free trade area, but instead of providing leadership it causes fragmentation. The UK faces a referendum on membership itself and there is also the Scottish referendum of September 18. There is also the Catalan call for a referendum on December 18. In fact, Europe has more regions with a historical identity – as Bismarck’s creation of Germany is only 150 years in the past for example. It would make a lot of sense to split up the EU or the CoE into such regions, with a common trade area with some services like money, defence, harmonisation of law and inspection of agreed standards. See for example the Eurotopia map (1992) by Freddy Heineken, aided by Herman Wesseling and Wim van den Doel. Conceivably the regions could select the House of Parliament and the nations could select the Senate, thus with a better match of political interests. (4) Of crucial importance is the political system and the performance of the political parties. The EP is more ritual than parliament. Power is transferred to the European Council without matching democratic control. There is no European demos with media and discussion. Those exist in the separate nations but the quality leaves to be desired. When parties don’t function there is no democracy. See for example this short discussion of the German elections of last September and the electoral deception by Angela Merkel. It is amazing that Europe functions as it is: but it doesn’t really function, witness the mass unemployment. Europe, love it or leave it. Youth unemployment has been above 20% for a couple of years now and rose to 24%, see Eurostat. It is 40% in Italy and 56% in Spain. Blame the leaders and parliaments of Italy and Spain, but also those of Germany, since we are all European, aren’t we ? Surely, if we include education, then on average “only” 10% of those below 25 are without activity, but still, if you are not in education and have to find a job then it is tough. The riots in Greece and Italy are bitter, now called the pitchfork protests. New is the issue whether kissing a police helmet (with a police officer in it) is sexual assault or acceptable peaceful civic disobedience. The answer from EU president Herman van Rompuy is a “roadmap” that works toward more integration, faster than originally conceivable, but still curiously slow if it really would be a solution. Above “mindmap” provides an alternative view. The rules in the EU don’t tackle the age-old differences of North vs South and East vs West. Rather than squaring the circle, or forcing a big square into a small circle, a better option is to accept the impossibilities. The new theory of the optimal currency area mentioned above may still turn the Euro into a success and help resolve European unemployment, but the key alternative prospect is not a superstate but a community of nations and regions including Russia.